(1) Recessions. Since 1947, when quarterly GDP was first compiled, there have been 17 presidential elections. There were 11 recessions over this period, and almost all of them either coincided with elections or occurred shortly thereafter. There were only five instances when there was no recession between elections. The political cycle suggests a high probability of a recession next year. I’m not sure what Hillary might do to cause one, though I’m sure she can think of something. It’s not hard to foresee a recession next year if the Donald wins and immediately declares that our trade treaties are null and void, slaps tariffs on imports from Mexico and China, and penalizes US companies that he views as having sent US jobs abroad. On the other hand, either one of them might not venture far from the status quo of the past several years, which has been a bullish environment for stocks. The next three meetings of the FOMC are scheduled for September 20-21, November 1-2, and December 13-14. After the statement was released, the bond market rallied and the spread between the 12-month ahead and the nearby federal funds future narrowed. My analysis of the federal funds rate since 1954 shows that the Fed has on several occasions held off on raising this rate until after the presidential elections. The same is likely to happen this year. I am still thinking that none-and-done is more likely than one-and-done this year. However, a rate hike during the last meeting of the year is possible. If the “gradual” normalization of monetary policy means a 25bps increase once a year for the foreseeable future, then rates will remain awfully low for a while. (3) Bear markets. Since 1961, there have been nine bear markets in the S&P 500. Five of them coincided with the elections, and they were among the longest of the lot. Admittedly with the benefit of hindsight, the recent backup in bond yields shouldn’t be a surprise. That’s because there has been a strong positive correlation between the daily Citigroup Economic Surprise Index (CESI) and the 13-week change (in basis points) in the weekly average of the 10-year US Treasury bond yield since the start of the CESI data in 2003. The yield spread between the 12-month ahead and the nearby federal funds rate futures has widened from zero on June 27 to 18.5bps on Thursday. Interestingly, this spread doesn’t correlate well with the CESI. The spread continues to suggest that a Fed rate hike over the next 12 months is unlikely. That may help to keep a lid on the bond yield despite the recent rebound in the CESI. I lowered our forecast range for the government bond from 2.0%-2.5% to 1.5%-2.0% on April 6. That remains my forecast for the rest of the year, though I will be keeping a close eye on the CESI. Sylvester Stallone celebrated his 70th birthday on a yacht in Saint-Tropez on Saturday. The film star has appeared in seven “Rocky” movies about fictional underdog-to-champ boxer Rocky Balboa. In the latest one, “Creed” (2015), he was too old to box, so he coached instead. Like Rocky, the current bull market is aging, but still putting up a great fight. It started on March 6, 2009 on an intraday basis, when the S&P 500 touched 666. As of yesterday’s close, it is up 216%. Not bad for a seven-year-old bull. An actual bull can live from 5-15 years, depending on how well behaved he is and how his libido and fertility rate hold up over time. There has been much chatter and even smirking lately about the inability of the bull to charge ahead to new highs after last doing so on May 21, 2015. Apparently, the recent drop in the 10-year Treasury bond yield was the little blue pill that boosted the libido of the bull. Almost since the start of the bull market, I have observed that it has been a series of panic attack corrections followed by relief rallies to new cyclical highs and then new record highs (exceeding the October 9, 2007 previous record peak) since March 28, 2013. Investors were traumatized by the financial crisis of 2008. So it doesn’t take much to convince them that the world is coming to an end imminently. Of course, the major central bankers were also traumatized by the event. It doesn’t take much to convince them that they must provide another round of ultra-easy monetary policy to avert a repeat of the financial crisis of 2008. Everyone’s primal fear is that the next crisis will be the widely dreaded “Endgame” scenario--a financial crisis unstoppable by central bankers who have run out of ammo. Yields in the U.S., Europe and Japan have been plummeting as investors pile into government debt in the face of tepid growth, low inflation and high uncertainty, and as central banks cut rates into negative territory in many countries. Even Friday, despite a strong U.S. jobs report that helped send the S&P 500 to nearly a record, yields on the 10-year Treasury note ultimately declined to a record close of 1.366% as investors took advantage of a brief rise in yields on the report’s headlines to buy more bonds. Yields move in the opposite direction of price. As yields keep falling in these haven markets, investors are looking for income elsewhere, creating a black hole that is sucking down rates in ever longer maturities, emerging markets and riskier corporate debt. At the beginning of last year, most bond investors were bearish because they expected the Fed would taper and then terminate QE, which is what happened last October. Then bond investors anticipated that the Fed might start raising interest rates by the middle of this year. This could still happen. However, it might be one-and-done for Fed rate hikes this year. If so, then US bond yields might continue to fall, driven lower by the gravitational pull of German and Japanese yields. Rather than decoupling, they might remain very much coupled. Back then, the US 10-year government bond yield was at 1.83%, while the comparable German and Japanese yields were 0.37% and 0.36%. Yesterday, the US yield was at 1.53%, while the German and Japanese yields were -0.09% and -0.29%. The ongoing plunge in bond yields to new record lows around the world is starting to become worrisome. The concern is that the bond market is foreshadowing a global recession. Here is the latest roundup of a selection of key 10-year government bond yields around the world from highest to lowest: US (1.38%), Italy (1.25), Spain (1.19), UK (0.76), France (0.13), Sweden (0.09), Germany (-0.18), and Japan (-0.28). The yield curve is widely viewed as a good business cycle indicator. Indeed, it is one of the 10 components of the Index of Leading Economic indicators in the US. Yield curves around the world are flattening, though they haven’t inverted just yet, which is widely viewed as a sure sign of an imminent recession. The yield spread between 10-year US Treasury bond and the two-year note is down to 81bps, the lowest since November 14, 2007. The former is falling faster than the latter. Following the Brexit vote, the federal funds rate in the futures market 12 months from now fell 17bps to 0.42%, implying no change in Fed policy over this period. This is certainly consistent with my forecast since the end of last year that one-and-done or even none-and-done were the most likely outlooks for rate-hiking this year. It also has contributed to the bond rally, especially in the US. In the past, the Fed rarely gave much weight to overseas economic developments. Now that the Fed seems to be doing so, the globalization of US monetary policy also has globalized the US bond market. I’m not convinced that the bond market is signaling a recession in the US or even in the global economy. It is confirming that overseas central banks will continue to pursue their ultra-easy monetary policies, and that the Fed will postpone additional rate hikes. Undoubtedly, the negative official interest rates of the ECB and BOJ are major contributors to the race to zero and below in bond yields. So is the ECB’s corporate bond-buying program, which started in June, and may be hard to implement given that the reach-for-yield mania is back with a vengeance, with everyone swooping up bonds and putting them away. The problem is that the flattening of the yield curve around zero percent is bad news for banks and other financial intermediaries. (1) Global economy is weak. Low bond yields are justified by the lackluster pace of global economic activity. The global economy is still growing, though slowly. I doubt that Brexit will cause a global recession, but it does increase the vulnerability of the global economy to a downturn should more bad stuff happen. If Brexit leads to the meltdown of the Italian banks or to “Quitaly,” then Europe could fall into a recession and drag down the global economy. The latest global composite PMI was 51.1 during June, unchanged from the previous month. The M-PMI component edged up from 50.0 to 50.4, while the NM-PMI edged down from 51.4 to 51.3. Interestingly, the composite index is a bit higher in developed economies at 51.5 than in emerging economies at 50.1. The Eurozone’s composite has been relatively stable around 53.0 for the past five months. The volume of retail sales in the Eurozone is up 1.6% y/y in May, and is back near the previous record high during 2007. All of the above is consistent with a scenario of global secular stagnation rather than a recession. (2) US economy is mixed. Another upbeat indicator popped up on Friday in the US. The ISM M-PMI rose from 51.3 during May to 53.2 during June. Leading the way were solid readings in the new orders and production components, at 57.0 and 54.7 respectively. In May, the ATA truck tonnage index rose 2.7% m/m after spiking up in March and down in April. The 12-month average rose to yet another new record high in May. The bad news is that non-defense capital goods orders excluding aircraft was down 3.8% y/y in May to the lowest since April 2011. Brexit: Breaking Bullish or Bearish? During my visits with our accounts at the beginning of this week, I didn’t sense as much anxiety about the selloff in equities during Friday of last week and this past Monday as I detected among our accounts during the correction at the start of the year. Perhaps we are all getting inured to the recurring panic attacks of this bull market. Bears have argued that there is too much complacency. So they were happy to growl “we told you so” earlier this week, though the remarkable rebound from Tuesday through Thursday should be disturbing them. The S&P 500 hit a record high on May 21, 2015. Despite the latest relief rally following the two-day Brexit panic attack, it has been over 400 days since the S&P 500’s last record high. I remain in the secular bull camp. I expect a resumption of the current bull market. I think that could start to happen after the November elections. I am still targeting 2200-2300 by mid-2017 for the S&P 500. (1) Aggregate revenues should grow 4% next year. On an aggregate basis (rather than per-share), S&P 500 revenues fell 1.0% y/y during Q1. These comps have been negative since Q1-2015 as a result of the plunge in the Energy sector’s earnings. Excluding them from the S&P 500 shows that the growth rate has remained just above zero over this same period and was 2.2% during Q1 of this year. (2) Revenues per share should grow 5%-6% next year. On a per-share basis, S&P 500 revenues rose 0.5% y/y during Q1 as corporations reduced their share count through buybacks. (I can’t do the same comparison excluding Energy on a per-share basis.) Buybacks and acquisitions could add 1-2 percentage points to revenues growth on a per-share basis next year. (3) Business sales data are highly correlated with S&P 500 revenues. The growth rates in aggregate S&P 500 revenues with and without Energy are highly correlated with the growth rates in total manufacturing and trade sales with and without petroleum products. During April, business sales fell 1.3% y/y, but rose 0.8% excluding petroleum products. (4) Here’s my bottom line on the top line. So I expect aggregate revenues growth to rebound to about 4% next year. On a per-share basis, it could be closer to 5%-6% as a result of buybacks, which I’ve discussed many times before. I am assuming that oil prices will stabilize around current levels. (5) The recent strength in the dollar doesn’t concern me all that much. Historically, there has been a decent correlation between aggregate S&P 500 revenues growth and the inverse of the y/y percentage change in the trade-weighted dollar. A weak (strong) dollar tends to boost (depress) revenues. Given the plunge in oil prices, it’s worth looking at this relationship excluding Energy from aggregate revenues. When I do so, my conclusion is that the soaring dollar, which was up as much as 21.3% on a y/y basis on July 20, 2015, doesn’t seem to have weighed as much on revenues as it might have in the past. That may be because a strong dollar not only depresses demand for US exports and reduces the dollar value of earnings from abroad but also lowers input costs priced in dollars. (6) Margins should remain high. The S&P 500 profit margin edged up to 8.7% during Q1-2016 from 8.0% during the previous quarter, which was the lowest since Q4-2009. However, excluding Energy, the margin was 9.7% during the first quarter. It has been hovering around 10.0% since Q1-2013. These numbers are based on operating earnings data compiled by S&P, which tend to be closer to GAAP earnings than Thomson Reuters (TR) data. I prefer the latter data but have to use the S&P data instead when calculating metrics with and without Energy. The TR data show that the profit margin peaked at a record high of 10.7% during Q2-2015. It fell to 9.8% during Q1, which still exceeded the previous cyclical peak of 9.5% in Q2-2007. I can also derive a broader profit margin using after-tax corporate profits from current production in the National Income & Product Accounts and dividing it by GDP. That shows that the margin was 7.7% during Q1, up slightly from the previous quarter but down from the 10.1% record high during Q4-2011. My bottom line on the profit margin is that it should remain around current cyclical highs for the foreseeable future. (7) Earnings growth should match revenues growth. If my outlook for the profit margin is correct, then earnings-per-share growth should be the same as revenues-per-share growth, which I reckon will be 5%-6% next year. (8) Valuation is high, but record-low yields are supportive. While stock valuation multiples are historically high, they aren’t excessively so given how low bond yields are currently. However, I don’t want to push my luck and argue that valuations are attractive given the low interest rates, which reflect a tough environment for earnings growth. In my most likely scenario, with a 60% subjective probability, earnings grow at the same pace as revenues and stock prices appreciate at that same pace, i.e., 5%-6%. I can’t rule out a Melt-Up scenario, to which I continue to assign a 30% probability, given that the 10-year Treasury is now under 1.50%. 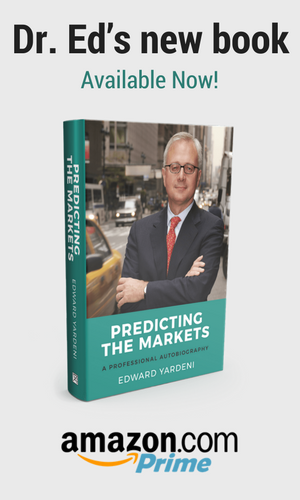 The remaining 10% would be a Meltdown scenario, which has been a recurring scare during the current bull market. So far, every panic attack has been a buying opportunity. I suspect that will hold true for the Brexit panic of recent days as well.